Understand Newton’s third law of motion. Apply Newton’s third law to define systems and solve problems of motion. There is a passage in the musical Man of la Mancha that relates to Newton’s third law of motion. Sancho, in describing a fight with his wife to Don Quixote, says, “Of course I hit her back, Your Grace, but she’s a lot harder than me and you know what they say, ‘Whether the stone hits the pitcher or the pitcher hits the stone, it’s going to be bad for the pitcher.’” This is exactly what happens whenever one body exerts a force on another—the first also experiences a force (equal in magnitude and opposite in direction). Numerous common experiences, such as stubbing a toe or throwing a ball, confirm this. It is precisely stated in Newton’s third law of motion. Whenever one body exerts a force on a second body, the first body experiences a force that is equal in magnitude and opposite in direction to the force that it exerts. This law represents a certain symmetry in nature: Forces always occur in pairs, and one body cannot exert a force on another without experiencing a force itself. We sometimes refer to this law loosely as “action-reaction,” where the force exerted is the action and the force experienced as a consequence is the reaction. Newton’s third law has practical uses in analyzing the origin of forces and understanding which forces are external to a system. We can readily see Newton’s third law at work by taking a look at how people move about. Consider a swimmer pushing off from the side of a pool, as illustrated in Figure 1. She pushes against the pool wall with her feet and accelerates in the direction opposite to that of her push. The wall has exerted an equal and opposite force back on the swimmer. You might think that two equal and opposite forces would cancel, but they do not because they act on different systems. In this case, there are two systems that we could investigate: the swimmer or the wall. If we select the swimmer to be the system of interest, as in the figure, then is an external force on this system and affects its motion. The swimmer moves in the direction of In contrast, the force acts on the wall and not on our system of interest. Thus does not directly affect the motion of the system and does not cancel Note that the swimmer pushes in the direction opposite to that in which she wishes to move. The reaction to her push is thus in the desired direction. Figure 1. When the swimmer exerts a force Ffeet on wall on the wall, she accelerates in the direction opposite to that of her push. This means the net external force on her is in the direction opposite to Ffeet on wall. This opposition occurs because, in accordance with Newton’s third law of motion, the wall exerts a force Fwall on feet on her, equal in magnitude but in the direction opposite to the one she exerts on it. The line around the swimmer indicates the system of interest. Note that Ffeet on wall does not act on this system (the swimmer) and, thus, does not cancel Fwall on feet. Thus the free-body diagram shows only Fwall on feet, w, the gravitational force, and BF, the buoyant force of the water supporting the swimmer’s weight. The vertical forces w and BF cancel since there is no vertical motion. Other examples of Newton’s third law are easy to find. As a professor paces in front of a whiteboard, she exerts a force backward on the floor. The floor exerts a reaction force forward on the professor that causes her to accelerate forward. Similarly, a car accelerates because the ground pushes forward on the drive wheels in reaction to the drive wheels pushing backward on the ground. You can see evidence of the wheels pushing backward when tires spin on a gravel road and throw rocks backward. In another example, rockets move forward by expelling gas backward at high velocity. This means the rocket exerts a large backward force on the gas in the rocket combustion chamber, and the gas therefore exerts a large reaction force forward on the rocket. This reaction force is called thrust. It is a common misconception that rockets propel themselves by pushing on the ground or on the air behind them. They actually work better in a vacuum, where they can more readily expel the exhaust gases. Helicopters similarly create lift by pushing air down, thereby experiencing an upward reaction force. Birds and airplanes also fly by exerting force on air in a direction opposite to that of whatever force they need. For example, the wings of a bird force air downward and backward in order to get lift and move forward. An octopus propels itself in the water by ejecting water through a funnel from its body, similar to a jet ski. In a situation similar to Sancho’s, professional cage fighters experience reaction forces when they punch, sometimes breaking their hand by hitting an opponent’s body. A physics professor pushes a cart of demonstration equipment to a lecture hall, as seen in Figure 2. Her mass is 65.0 kg, the cart’s is 12.0 kg, and the equipment’s is 7.0 kg. Calculate the acceleration produced when the professor exerts a backward force of 150 N on the floor. All forces opposing the motion, such as friction on the cart’s wheels and air resistance, total 24.0 N.
Figure 2. A professor pushes a cart of demonstration equipment. The lengths of the arrows are proportional to the magnitudes of the forces (except for f, since it is too small to draw to scale). Different questions are asked in each example; thus, the system of interest must be defined differently for each. System 1 is appropriate for Example 2, since it asks for the acceleration of the entire group of objects. Only Ffloor and f are external forces acting on System 1 along the line of motion. All other forces either cancel or act on the outside world. System 2 is chosen for this example so that Fprof will be an external force and enter into Newton’s second law. Note that the free-body diagrams, which allow us to apply Newton’s second law, vary with the system chosen. Since they accelerate as a unit, we define the system to be the professor, cart, and equipment. This is System 1 in Figure 2. The professor pushes backward with a force of 150 N. According to Newton’s third law, the floor exerts a forward reaction force of 150 N on System 1. Because all motion is horizontal, we can assume there is no net force in the vertical direction. The problem is therefore one-dimensional along the horizontal direction. As noted, opposes the motion and is thus in the opposite direction of Note that we do not include the forces or because these are internal forces, and we do not include because it acts on the floor, not on the system. There are no other significant forces acting on System 1. If the net external force can be found from all this information, we can use Newton’s second law to find the acceleration as requested. See the free-body diagram in the figure. 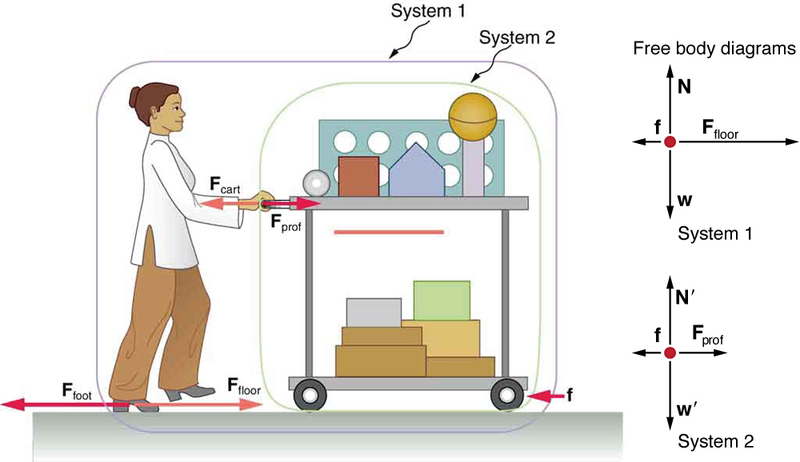 None of the forces between components of System 1, such as between the professor’s hands and the cart, contribute to the net external force because they are internal to System 1. Another way to look at this is to note that forces between components of a system cancel because they are equal in magnitude and opposite in direction. For example, the force exerted by the professor on the cart results in an equal and opposite force back on her. In this case both forces act on the same system and, therefore, cancel. Thus internal forces (between components of a system) cancel. Choosing System 1 was crucial to solving this problem. Calculate the force the professor exerts on the cart in Figure 2 using data from the previous example if needed. If we now define the system of interest to be the cart plus equipment (System 2 in Figure 2), then the net external force on System 2 is the force the professor exerts on the cart minus friction. The force she exerts on the cart, is an external force acting on System 2. was internal to System 1, but it is external to System 2 and will enter Newton’s second law for System 2. It is interesting that this force is significantly less than the 150-N force the professor exerted backward on the floor. Not all of that 150-N force is transmitted to the cart; some of it accelerates the professor. The choice of a system is an important analytical step both in solving problems and in thoroughly understanding the physics of the situation (which is not necessarily the same thing). Visualize the gravitational force that two objects exert on each other. Change properties of the objects in order to see how it changes the gravity force. Newton’s third law of motion represents a basic symmetry in nature. It states: Whenever one body exerts a force on a second body, the first body experiences a force that is equal in magnitude and opposite in direction to the force that the first body exerts. A thrust is a reaction force that pushes a body forward in response to a backward force. Rockets, airplanes, and cars are pushed forward by a thrust reaction force. 2: A device used since the 1940s to measure the kick or recoil of the body due to heart beats is the “ballistocardiograph.” What physics principle(s) are involved here to measure the force of cardiac contraction? How might we construct such a device? 3: Describe a situation in which one system exerts a force on another and, as a consequence, experiences a force that is equal in magnitude and opposite in direction. Which of Newton’s laws of motion apply? 4: Why does an ordinary rifle recoil (kick backward) when fired? The barrel of a recoilless rifle is open at both ends. Describe how Newton’s third law applies when one is fired. Can you safely stand close behind one when it is fired? 5: An American football lineman reasons that it is senseless to try to out-push the opposing player, since no matter how hard he pushes he will experience an equal and opposite force from the other player. Use Newton’s laws and draw a free-body diagram of an appropriate system to explain how he can still out-push the opposition if he is strong enough. 6: Newton’s third law of motion tells us that forces always occur in pairs of equal and opposite magnitude. Explain how the choice of the “system of interest” affects whether one such pair of forces cancels. 1: What net external force is exerted on a 1100-kg artillery shell fired from a battleship if the shell is accelerated at What is the magnitude of the force exerted on the ship by the artillery shell? 2: A brave but inadequate rugby player is being pushed backward by an opposing player who is exerting a force of 800 N on him. The mass of the losing player plus equipment is 90.0 kg, and he is accelerating at backward. (a) What is the force of friction between the losing player’s feet and the grass? (b) What force does the winning player exert on the ground to move forward if his mass plus equipment is 110 kg? (c) Draw a sketch of the situation showing the system of interest used to solve each part. For this situation, draw a free-body diagram and write the net force equation. 4.4 Newton’s Third Law of Motion: Symmetry in Forces by OpenStax is licensed under a Creative Commons Attribution 4.0 International License, except where otherwise noted.